Music Mart is a family owned and operated music store operating out of Perth and online. Stocking a comprehensive range of beginner to intermediate instruments, Music Mart will ship guitars, drums, pianos, keyboards, wind and brass instruments, as well as a long list of accessories to anywhere in Australia. Music Mart is an online music store operating out of Perth. It is run by Andrew and Kathryn Neve who started the Hills school of guitar, which is still operational and set about teaching drums, piano, violin, saxophone, flute, clarinet, and keyboard. Andrew and Kathryns passion for music drove them to purchase Music Mart in Midland, Perth as an accompaniment to their school and have since expanded its purchasing power and its online abilities. Today Music Mart is a comprehensive online music store catering to children, beginners and semi professionals. Generally speaking our instruments cost no more than $3500 and we sell just about every instrument imaginable, from strings, percussion, to wind, brass and electronic. We stock an extensive range of guitars, classical and electric, drum sets, banjos, ukuleles, digital pianos, keyboards, clarinets, cellos, double bass’, flutes, saxophones, trumpets, trombones, violas and recorders. We also stock a huge range of equipment and accessories such as amplifiers, speakers, straps, bags, microphones, racks, tuners, capos, drumsticks and sheet music for every instrument. 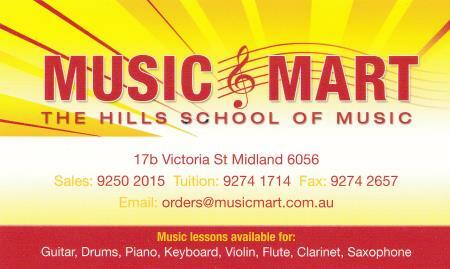 Music Mart ship Australia wide or you can come into the midland store.